For a 5 star hotel we were disappointed that we had to ask for supplies such as toilet rolls to be refreshed. Also the Gatekeepers Lodge had a narrow entrance gate. This was understandable but what was not acceptable was that having driven in there was not enough space to turn the car around. In the end we left our car outside - in the entrance to the building site. Your smiling staff, your setting in the hills, your comfortable lodgings, your peerless food & wine were a treat that we will revisit soon! Great setting, excellent service by staff,the dinner in the resteraunt unfortunately left my stomach feeling uncomfortable too many fancy things should be more emphasis on the main item of entree and main courses, red wine list disappointing , too many unknowns wines and prices unrealistic for what they were. Great venue but the room was extremely musty. We were in room 6. I could not sleep as I was worried my husband was going to have an asthma attack. Fantastic, relaxing stay - wasn't long enough! Food was amazing. Surrounds were gorgeous. Felt very relaxed and pampered. Just right for our accomodation needs as an adult family. Mount Lofty house exceeded our expectations from the moment we arrived. While I sipped a glass of bubbles on arrival, my husband followed another couple out of the hotel as they were being shown how to get to the mount Lofty summit track by the guests service’s manager David. Thankfully this was a good idea as it’s a bit tricky for the first 5 minutes and David continued to give this type of personal service throughout our stay. He welcomed us to join him at 5.00pm over a drink and a tour of the house. The HVR dining that first night was fabulous, the staff in the dining room were very attentive. In fact that was the standout, customer service was extremely high. We didn’t quite feel like we were at a hotel, this is a level above, at a grand accommodation with old fashioned service. Fantastic! Very friendly team of staff. Very professional and attentive. Great location and surrounds. The food was amazing in a wonderful bar and restaurant with a warm and inviting ambiance. Waterhouse lounge: food very good, smart & friendly service, cosy atmosphere. Breakfast: very good all the way. My husband and I stayed in the Gatekeepers cottage on the 2nd and 3rd April, we married nearby in Crafers on the 3rd. 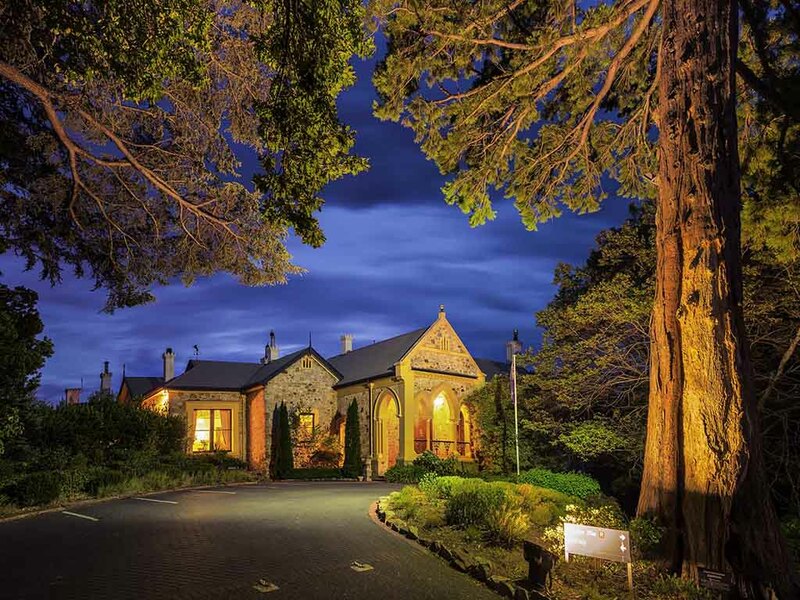 We had a wonderful time staying at Mt Lofty House and couldn’t have wished for anything better. The welcome was lovely and the staff made us feel very special. Our accommodation was perfect and in a romantic setting. The sparkling wine in the fridge and a bowl of fruit a nice touch. We had our wedding dinner in Hardy’s Restaurant and the food and service were exceptional. We’d decided to elope and it was just the two of us, My Lofty House was just right for us. We can’t wait to return and we hope to have our anniversary’s there as well. Thank You to the wonderful staff. The experience was amazing due to the excellent service and friendliness of the staff and of course the amazing location. The bedrooms are extremely well decorated which impressed my wife who is into interior decorating. We stayed at Mt Lofty house for a family wedding, we were very well looked after, our room was just superb and the venue was just gorgeous. Mount Lofty House is a wonderful place to stay. We had dinner and the food and service was nothing short of amazing. The only negative was being asked to pay extra for a hot breakfast and barista coffee. These should be included in the room rate.